The Ideal: Memorial and Tribute Flowers can be a beautiful and true reflection of the life of your loved one. Those who attend the service should be able to recognize their loved one's personality in the flowers and designs, thus truly enjoying a sense of comfort and care on an otherwise difficult day. This takes a bit of time to achieve, and some real dialogue with the florist, but the results are worth it. Use this contact form to reach Julia's Floral. We will schedule a phone call with you to learn more about your loved one, and discuss the options available for the service. Every service is different, so we don't use a web-store with pre-selected items. I'm looking for Julia's Floral. How did I end up here? a. There's a simple explanation. Julia Miller, owner/designer of Julia's Floral for 30 years, has retired from weddings to spend more time with family, especially grandchildren. a. 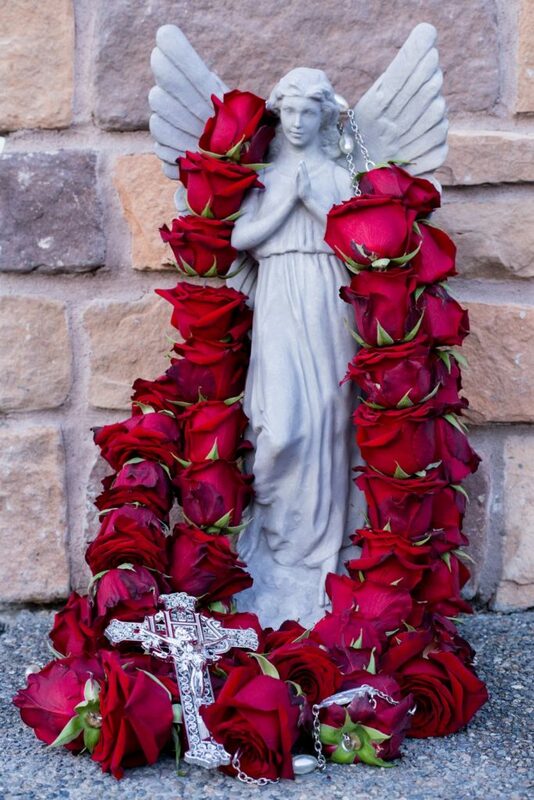 Sympathy and Memorial flowers, especially Rosaries for Catholic funerals. Freshrosary.com is her new website venture. Is Julia making any exceptions for wedding clients? a. On a case-by-case basis, for longtime friends and repeat client families. If you have history with Julia, ask for date availability. Her answer might be yes. And if it's not, she knows good florists to refer. What is Julia's daily-rate for special floral design projects? a. Thanks for asking! To coax her out of retirement mode, $750 per day plus supplies, travel and lodging, based on date availability. Sales tax is added where applicable. Does Julia teach classes or work with DIY clients? a. Propose your project and if Julia is available and wants to get involved, her time is at the above rate, plus the retail price of flowers and supplies. No delivery or set-up is offered, and you arrange for your own cooler space. © Copyright Fresh Rosary. All Rights Reserved.